This recipe for the perfect pan-seared filet mignon is easier than you think. With the right meat, tools and directions you can make this restaurant quality meal at home! This post is sponsored by The Kansas City Steak Company. A few years ago I learned how to cook the perfect pan-seared filet mignon and I’m not gonna lie, it’s kind of life changing. 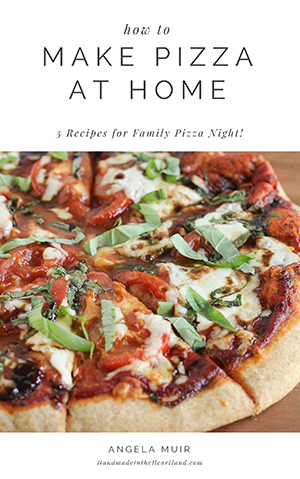 All of the sudden you feel like you can make a restaurant quality meal right at home. It’s actually crazy simple and it’s all about getting a great quality steak and paying attention to your cooking time. I’m a huge fan of the quality of the meat from The Kansas City Steak Company, (and of course I love to support local KC companies) honestly friends these steaks are top notch. 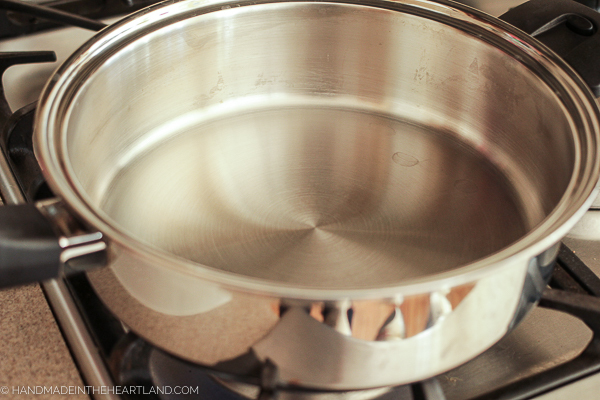 Step 1: Heat your pan. Having a high quality, heavy bottomed stainless steel skillet is going to ensure the best results. Have you ever had a filet at a steakhouse and wondered how they get the delicious crust on the outside of the meat? It’s 100% due to the heat of the skillet when the meat goes in. You want that pan piping hot! Step 2: Don’t mess with the meat. Once you place your meat into the skillet don’t touch it! You should hear it sizzle when it is placed onto the pan and then you leave it there. Having it cook without moving it ensures that beautiful crust that we all love. To get an exact time for your cut of meat visit the Kansas City Steak Company’s meat cooking chart HERE. Step 3: Flip it. Once your time for the first side is up, flip it. I flip mine using tongs, I find tongs to be the best tools for flipping and turning steaks. Pay attention the time the steak is cooking. I set the timer on my phone, seriously! I don’t like my steak to be well done and I’ve been super disappointed when I have over cooked them, paying attention to the cook time is the only way to ensure the doneness you want. Step 4: Sear the sides. I like to try and sear my sides as well, so I flip them with tongs and carefully place them so they stand on the side. I usually only let them cook on each side for 1-2 minutes and try to move them around so I get all the sides nice and crispy as well. All said and done my steaks are not in the pan more than 15 minutes. Step 5: REST. Once you remove your meat from the pan tent it with foil and let rest for 5 minutes. this step is so important! You want it to come to serving temperature as well as absorb the juices into the steak, if you cut it right away you will see the juice all over your plate! 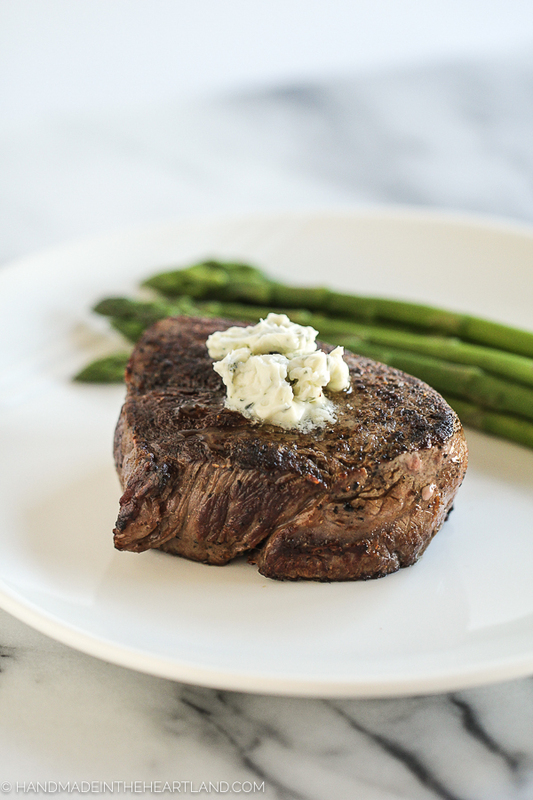 Knowing how to cook the perfect pan-seared steak will elevate your kitchen game, no question! It’s surprisingly simple to cook a delicious restaurant quality filet at home, stove-top with the right meat and the right tools. This recipe for the perfect pan-seared filet mignon is easier than you think. With the right meat, tools and directions you can make this restaurant quality meal at home! Remove your filets from the fridge 30 minutes prior to cooking. You want them to come to room temperature. Season the steaks with salt and pepper, take out the butter and let it also come to room temperature to ensure it’s nice and soft. 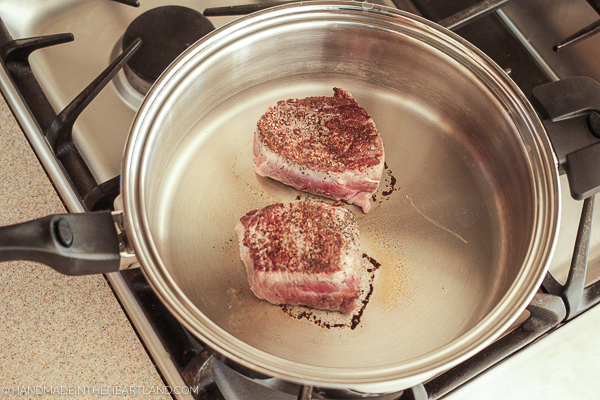 Heat a stainless steel skillet to high heat. 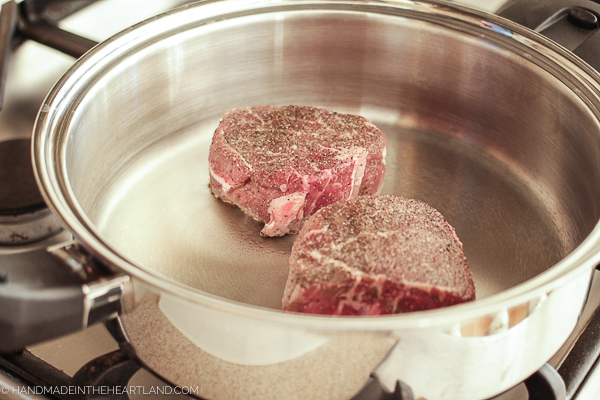 Place the filets on the dry skillet, you should hear them sizzle. Let them stay there for 6 minutes. don’t move them! 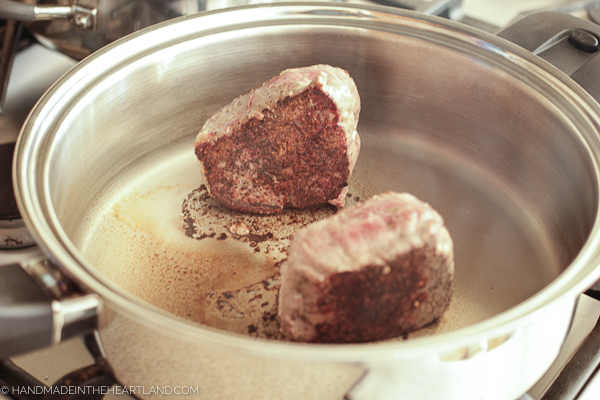 This creates the nice crispy crust we want on the outside of the filet. After 6 minutes flip them to the other side, I find tongs to be the best tool for this. Let it sit on that side for 5 minutes. Then using your tongs sear the sides by setting the filets on their sides, try and cook each area of the sides for 1-2 minutes. You can get a full list of cooking times based on desired done-ness and size of steak from Kansas City Steak Company HERE. Remove your steak from the pan, tent with foil if you like, and let rest for 5 minutes. do not cut into immediately! Resting allows the meat to absorb all the juices and be so delicious! 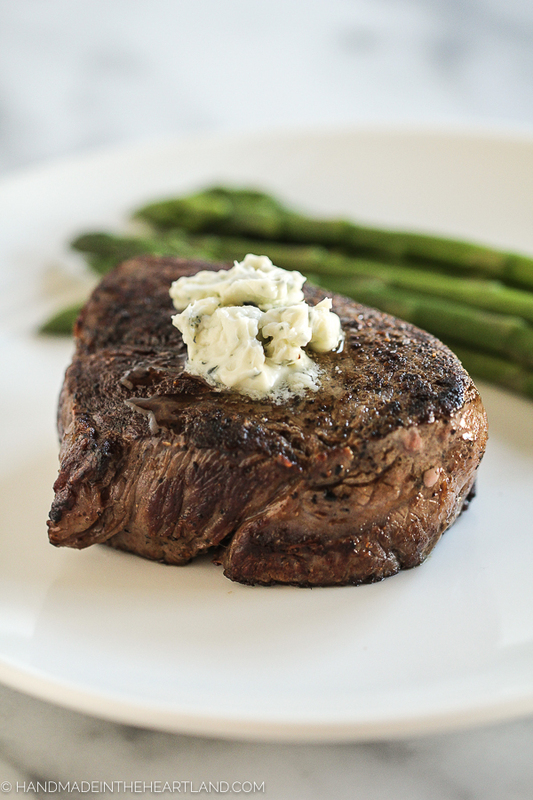 While you let your meat rest mix together the softened butter and blue cheese. I love a rich gorgonzola for this. Mix them together until they are completely combined. 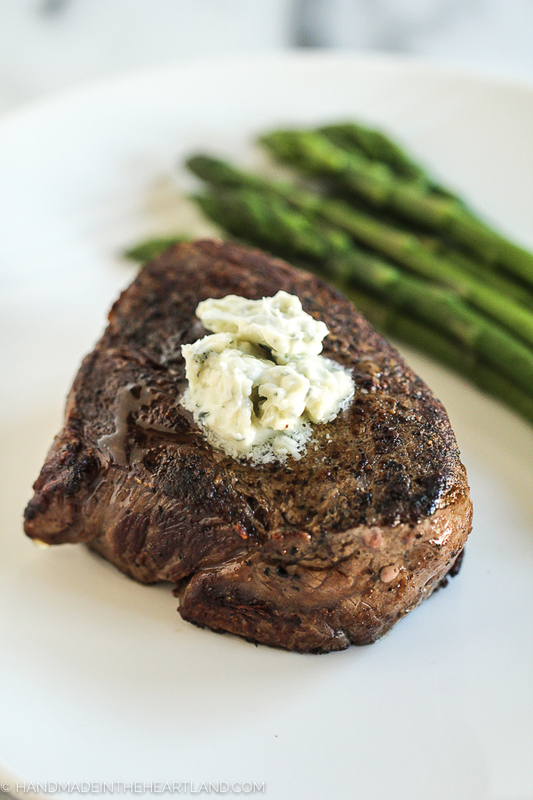 Spoon a pat of the blue cheese butter on top of each steak and serve! How do you cook your steak? I know most people are a fan of the grill but I would choose this method hands down over grilling, it just tastes better! Let me know if you try it! Share it with me in the comments or tag me on Instagram (@handmadeintheheartland) or facebook!